Following the start of production on Ant-Man yesterday, along with the addition of Judy Greer, Bobby Cannavale and John Slattery to the cast of Marvel's Phase Three comic book film, we have our first look at the superhero story. 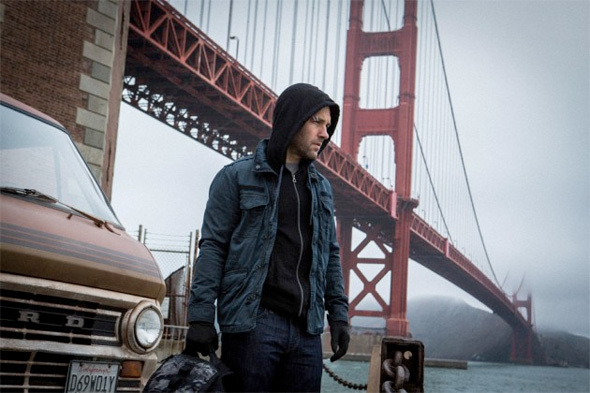 Paul Rudd plays a thief named Scott Lang who will go on to become a superhero with the help of scientist and mentor Hank Pym (Michael Douglas), and now we get to see him looking rugged before he takes a turn towards being a hero. He's got some kind of cut on his face, and looks like he's getting ready for a heist. It's not much, but we're glad Marvel got this out there before spy photos emerged. Look! Ant-Man is directed by Peyton Reed (Yes Man) with a script by Edgar Wright & Joe Cornish, rewritten by Adam McKay and Gabriel Ferrari & Andrew Barrer Armed with the astonishing ability to shrink in scale but increase in strength, con-man Scott Lang (Paul Rudd) must embrace his inner-hero and help his mentor, Dr. Hank Pym (Michael Douglas), protect the secret behind his spectacular Ant-Man suit from a new generation of towering threats. Against seemingly insurmountable obstacles, Pym and Lang must plan and pull off a heist that will save the world. Marvel Studios releases the film next summer on July 17th, 2015. Still think this was brilliant casting. Hope Marvel and Reed deliver with this film. I'd have a good chuckle if in 20 years they make a behind the scene documentary about Marvel's success and Feige admits to not having a clue and flying by the seat of his pants the whole time. The entire time he was listening to Firstshowing, lol. So much hype for Ant-Man Vs Yellowjacket! So much hype for Ant-Man Vs Yellowjacket Vs The Tick! I'd pay to see it. I do not think Rudd can act well enough to carry a movie of this scope. We will see. I think you're in the minority on this one. I'm excited for it. Couldnt be more right. IMO Rudd has the charisma to pull off anything he puts his mind to. Thats fine, and I am holding back judgement because Marvels track record buys them leeway from me on choices I find odd. I say this from a place that has never seen Rudd act outside of his zone, much like Seth Rogan. I have seen nothing from Rudd to convince me this is the role for him. But some one at Marvel did. SO I remain cautious but hopeful. Comparing Rudd to the likes of Seth is already a huge mistake. If you can find a role where he is acting out side of his comedy box, please let me know. I do not think I am missing anything. He has not been in any dramatic roles to show he has the chops or it. It is a fair comparison. Rogan and Rudd take roles(typically) that do not have them expanding their abilitys. Again, Marvel has done fantastic work thus far so I trust the choice they made, but I remain cautious. Our Idiot Brother is a pretty good example. it's still a comedy but it's not in the sense that you normally see from him. He's got the ability to pull this off. Not really what I imagined. Look very gritty though, in a good way. I can't wait to see how this all turns out.